Kearney won the Arnold Australia Pro Strongman sports festival just days before he married his long-term boyfriend Joey Aleixo. 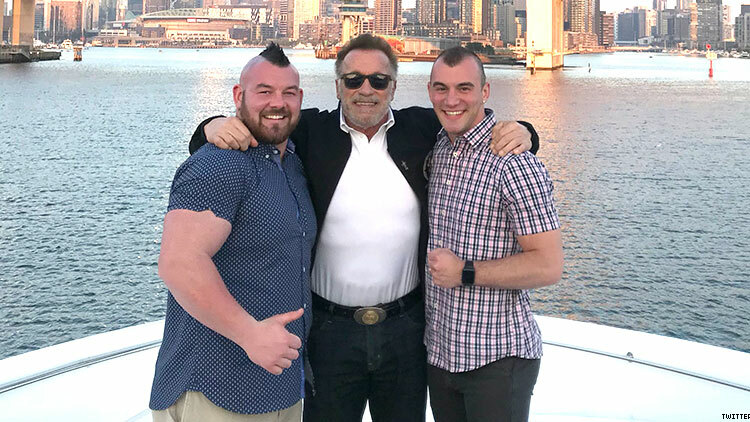 Former California governor, movie star, and body builder Arnold Schwarzenegger celebrated the wedding of strongman Rob Kearney and his new husband Joey Aleixo with an Instagram post showing the three men together. Kearney and Aleixo were married in Australia on Sunday just days after Kearney took first place at the Arnold Australia Pro Strongman sports festival. Kearney, 27, came out five years ago in a social media post announcing that Aleixo was his boyfriend at the time. Aleixo also Instagrammed a photo of the happy day. March 17th, 2019 is a day that i will never forget. Today is the day that I OFFICIALLY MARRIED MY BEST-FRIEND! @worlds_strongest_gay you will always have my heart and I cannot wait to see what the future has in store for us . . . A huge thank you to our celebrant @clairepatersoncelebrant, our videographers @de.videofilms, and photographer paul! Considered one of the strongest men in the world, Kearney is the head athletic trainer at the Williston Northampton School in Massachusetts when he’s not competing, according to Outsports.